for the entire first year of our marriage, austin was constantly going fishing. when we got married, i had no idea how much he loved fishing, though he tells me that he fished a lot while we were dating, i don't remember it at all. i just knew he loved to rock climb & snowboard, & that he had biked a lot, never do i remember him mentioning fishing. but i quickly learned after we were married how much he really loved fishing. & not just any kind of fishing, but fly fishing. i wasn't really sure what the huge draw to fly fishing was. i mean, i could count on one hand how many times i had been fishing in my life, so i was not at all that interested in it, but he was constantly driving all over utah, sometimes in montana & idaho, to go fishing. he also would bring home fly fishing movies he took from his dad that we would watch, some of which were boring but a few of them really caught my attention. so this past spring i told him i wanted to go out with him & try my hand at fly fishing. i figured it must be pretty fun since he loved to go so much, & that it probably wasn't nearly as boring as i assumed it was. so we went out a couple times & i really began to like it. 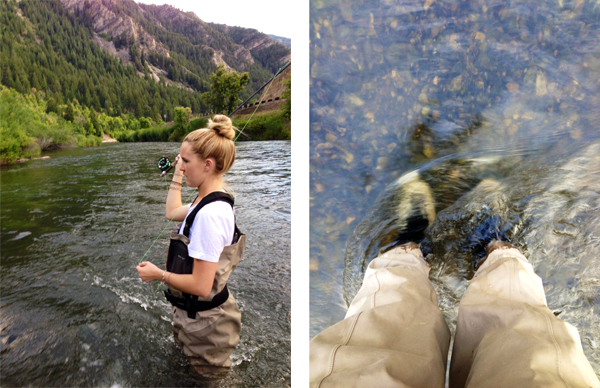 fly fishing isn't boring in the slightest. i loved the constant motion of casting & learning how to do it. i loved watching for the fish to figure out where to cast & the first time i felt a fish go for my fly was surprisingly exciting. like all my hard work had paid off, even if i lost it in the end. i was still pumped. austin has been patiently teaching & helping me out, tying my flies on since i don't know how & now he gets to carry cedar in the ergo, so it's a real family affair. people seem to think your life ends when you have a baby, but we've decided that cedar joined our lives, so we aren't going to slow down. but we were able to get a few pictures on our phones! Fishing is fun isn't it? Mark has always loved fishing as well and I tried my hand at it again this year and really enjoyed. We bait worms and go to creeks, but a fish is a fish no matter how you get it.